It hardly needs repeating that John Renbourn was a phenomenally talented guitarist who turned his hand to a variety of music – folk, jazz, blues, the start of the ‘Early Music’ movement. And he excelled in all of these, his playing studious and careful and at the same time wonderfully fluid and filled with a joie de vie that somehow captured a mischievous glint in the eye translated into a glorious sound. A stalwart of the club scene as a solo artist and in various duos and, post-Pentangle groups as well. This recording from 1978 is of a solo appearance. 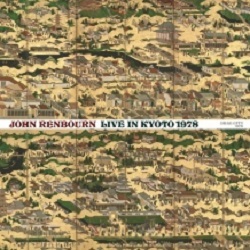 That the room being played was is Kyoto is of little import – similar sets would have appeared in France, Italy, or even in the UK – although it does serve to make the point that John Renbourn was a guitarist of world renown. On this very clear recording John Renbourn demonstrates his genius of guitar playing in a varied set that is warm and engaging. ‘Anji‘ is impressively run through at a breakneck speed. ‘Candyman‘ and ‘I know my Babe‘ are gently sung folk-blues which would be set staples over the years. Other songs which would also become regulars live such as ‘So Early in the Spring‘, ‘Banks of the sweet primroses‘ (particularly lovely here) and ‘The English Dance‘ would all turn up the following year on a solo album also called ‘So Early in the Spring‘. It’s a nicely balanced set, which closes out with a couple of tune-sets, with the spoken introductions of the songs also captured to tape. How essential this recording is probably really depends on the level of admiration one has already for John Renbourn. If you have the solo albums and the handful of already released live sets then you’ll probably want this as well. The more casual listener should still find this an enjoyable listen, but if you’ve never listened to John before you’d probably start elsewhere – ‘Bert and John‘, ‘John Renbourn‘, ‘Monday Morning‘ and ‘Faro Annie‘ would give a good introduction. Then, once hooked, swing around again and pick up this album. The beauty of acoustic guitar playing revealed by one of the true greats.